In the market for a diffuser? 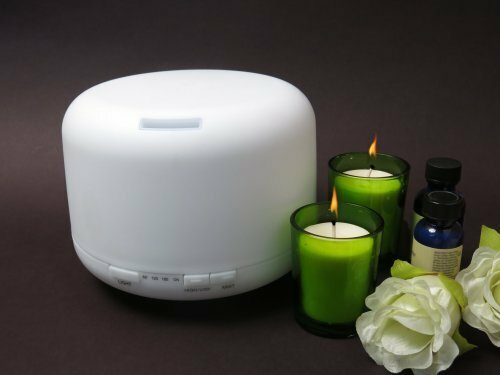 The Welledia Breeze Aromatherapy Ultrasonic Essential Oil Diffuser is worth a look. 4/5 stars. I got this Welledia Breeze Aromatherapy Ultrasonic Essential Oil Diffuser for my wife to use with her essential oils. The diffuser looks nice; it has a clean modern appearance. For those that enjoy colorful lighting, the diffuser has a setting to change the diffuser several different colors such as blue, red, purple, and green. The unit works well; however, the button labels do not make it intuitive to use (i.e. Turning unit On/Off, adjusting time). There is a High/Low button that changes the mist amount, but there is no clear indication if high or low is selected. It comes with instructions, and I suggest reading over them. The instructions are obviously written by someone that English is not their first language. They are readable, but not grammatically correct. You have the option setting the diffuser to be on for 60, 80, or 120 minutes. You can also set it to stay on until the mixture runs out. Regardless of which time setting you put it on, it will cut itself off when the oil/water mixture runs out. Additionally, the top can be rotated so that the mist is directed in the direction you desire. The diffuser is pretty easy to clean, especially when needing to change out oils. Also, the diffuser is easy to refill since it comes with its on water measuring cup. If you are looking for a diffuser, you should consider the Welledia Breeze Aromatherapy Ultrasonic Essential Oil Diffuser. My wife loves it. Is it worth the price? Maybe, but I would like to see the price around $35-40. I gave this diffuser a 4/5 rating based on the price and the fact that there is not a clear indication whether the mist is on high or low. Disclaimer: In full disclosure, I received this product complementary. However, the above review and description details my personal experience using the product. This review is an expression of my own unbiased opinion. I am in no way associated with Amazon nor the company selling this product.